Peter L. Brown Co. is proud to be a vendor and installer of Atlas Roofing shingles featuring Scotchgard Protector. Atlas Roof Shingles feature Scotchgard Protector to prevent algae from growing on roofs and discoloring them with ugly black streaks. Algae forms on any roof where moisture forms, but is especially problematic in high humidity areas (80% of the United States, including Connecticut). Atlas Roof Shingles with Scotchgard Protector are infused with copper granules to prevent algae growth. This prevents the need for pressure washing or chemical cleaning. Only 10 years after shingle installation. How To Clean Your Roof? If you ever notice the green or black telltale streaks of algae on your roof, there is a relatively easy way to get rid of it, aside from replacing your roof shingles. 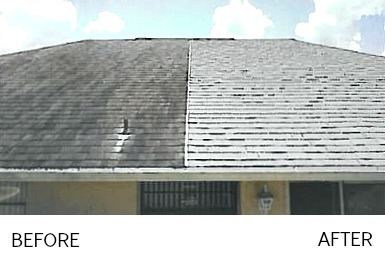 In order to clean your roof, simply spray wash your roof with a mixture of 50% water and 50% bleach. Once you’ve finished spraying the affected area, spray again with clean water to rinse everything off and your roof should be good as new- or close to it. One element of your home which is surprisingly easy to overlook is your roof. There are a number of reasons for this. In one sense, roof negligence can fall under out of sight out of mind. After all, we’re not usually in a position to get a good look at our roof unlike many other areas of our home. Another reason roofs are often ignored is because you will really only notice it is if something goes wrong. But even in this there’s somehow an additional downside. Because if your roof springs a leak in an area of your home which doesn’t make the issue immediately apparent the ensuing repair costs can go from costly to significant. Or worse. There are several things you can do to keep your roof in good shape of course. While having yearly inspections of your roof is a good step, the most effective way to ensure the health of your roof is by having it installed by someone you can trust. The Peter L. Brown Co. is an experienced and reliable roofing contractor. And we’re a proud vendor and installer of Atlas Roof Shingles. You can browse the several types of shingles that they offer below but you will find several things that each of them have in common. They’re all durable, reliable and incredibly well made. When your home has Atlas Roof Shingles installed by Peter L. Brown Co. you can rest assured that your home is covered. Why Choose Atlas Pro HP 42″ Shingles? Bigger shingles provide more protection. The Scotchgard Protector prevents algae streaks and helps the shingles retain their original color longer than most consumer grade shingles. The shingles come with a transferable Lifetime Limited Warranty, compared to the 30 year warranties offered by most other shingle manufacturers. The shingles have superior resistance to wind, up to 130 mph, and wind-driven rain. The Scotchgard Protector prevents black streaks that are caused by algae. The shingles are made with a rubberized polymer that makes them more durable and long lasting, even in extreme weather conditions. The shingles come with a limited lifetime warranty against manufacturing defects. The Scotchgard Protector prevents algae buildup, as well as cracking, splitting, warping, or shrinking in both hot and cold weather climates. The shingles are made with a rubberized polymer that makes them more durable and impact-resistant, especially when it comes to hail, flying debris, or harsh rain. The shingles come with a limited lifetime warranty against algae growth.